Membrane Electrodes considers the significant developments in the field of sensing probes, with an emphasis on membrane electrodes. This book is organized into three parts encompassing 11 chapters. Part I is an introduction to the variety of ion-selective membrane electrodes that have been constructed and with which experiments have been conducted. This part deals first with the thermodynamic principles and other concepts underlying the description of the behavior of electrolyte solutions, followed by a discussion on the various theories of membrane potential applicable to a variety of solid and liquid membrane electrodes. 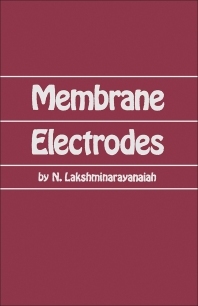 Part II describes the preparation, properties, and uses of the various solid and liquid membrane electrodes. Part III presents glass membrane electrodes as a prelude to the description of other membrane systems in which glass electrodes are invariably used as the primary sensing device. This book will prove useful to students, technologists, and researchers in various fields of science and technology.